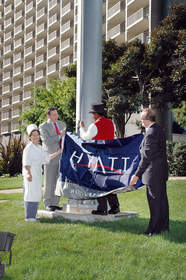 Associates of the new Hyatt Regency Century Plaza, Wanda Phongsamarn (left), cook, and James Lee (right in hat), doorman, join David Horowitz (left), hotel general manager, and Ty Helms (right), senior vice president of sales for Hyatt Hotels Corporation, in raising the Hyatt flag at the world-renowned property. Hyatt Regency Century Plaza will immediately begin a $22.5 million renovation that will include guest rooms, common space and the addition of a Regency Club level. 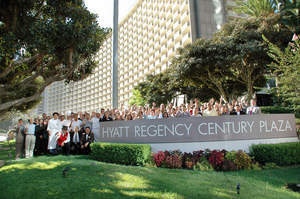 Associates of Hyatt Regency Century Plaza wave-in a new era in hotel management of the landmark hotel. Hyatt assumed management of the hotel October 5, 2005. Associates of the new<br> Hyatt Regency Century Plaza,<br> Wanda Phongsamarn (left),<br> cook, and James Lee<br> (right in hat), doorman,<br> join David Horowitz (left),<br>hotel general manager,<br> and Ty Helms (right),<br> senior vice president of<br> sales for Hyatt Hotels <br>Corporation, in raising <br>the Hyatt flag at the <br>world-renowned property.<br>Hyatt Regency Century<br> Plaza will immediately<br> begin a $22.5 million<br>renovation.